Welcome to my Mother's Day Gift Guide today I will talk about GeoDeo Natural Deodorant. Actually their is one scent that I will be reviewing today. The scent Island it smells really good. It has more of a fruity smell it reminds me of the beach. It has held up with keeping me fresh and clean and not sweaty. Specially formulated to be safe for your body and your world. The base ingredients in GEODEO are 100% natural, allergen-free, vegetable based and derived from renewable resources. Main ingredient approved by NPA and EcoCert. This deodorant contains no harmful aluminums, phthalates, parabens or propylene glycol. GEODEO® uses eco-technology to reduce greenhouse emissions and reduce energy consumed up to 50% compared to other deodorant sticks. 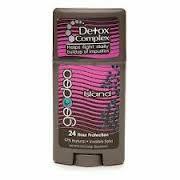 And now for the Giveaway one lucky winner will win one tube of the Island Deodorant!! Enter through the Rafflecopter Below!! I use Teen Spirit by Suave- usually powder scent. I use cheap dollar store brand, nothing works for me. I love the lilac scents! I use secret, and it's unscented. Right now I'm using Dove deodorant. I don't know what the scent is, but it's got a pink lid and it smells so good! I like Secret Sweet Pea. Right now I use secret roll on original scent, I kind of like the baby powder scents.